PHILADELPHIA (AP) — The nation's top law enforcement officer got a glimpse of the challenges facing ex-offenders attempting to rebuild their lives on Tuesday as he attended an unusual court session and then met with several of them afterward. Attorney General Eric Holder watched as more than a dozen men on supervised release updated a federal judge on their jobs and personal situations, discussing problems from needing more hours at work to the cost of cataract surgery for the family dog. 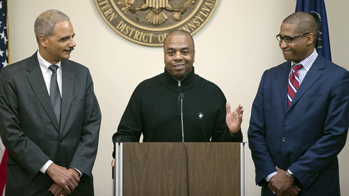 The proceeding before District Judge Felipe Restrepo in Phila­delphia is part of an innovative re-entry initiative designed to give former inmates the support they need to stay out of jail. Holder wants to find solutions to the country’s overburdened jails and high recidivism rates. The nation spent $80 billion on prisons in 2010, and yet federal facilities are still overflowing at 40 percent above capacity, Holder said. His visit to Philadelphia was the first of three to promote pioneering crime-prevention initiatives; he’ll visit St. Louis and Peoria, Ill., on Nov. 14. Federal court officials in Phila­delphia began the Supervision to Aid Re-entry, or STAR, program seven years ago. It aims to cut the city’s violent crime rate by addressing the social, family and logistical issues confronting ex-offenders when they return to society. The former inmates meet as a group with a judge every two weeks. In between, they might be working or taking mandated vocational training or parenting classes. Those who successfully complete the 52-week program can reduce their court-supervised release by a year. Graduates say each class of 15 to 20 people ends up being a pretty tight-knit group. “It gave me another family,” said Robert Warner, 46, of Philadelphia. Warner, who served 10 years on drug and gun charges, is now a manager at a suburban fast-food restaurant. Officials estimate the Phila­del­phia program has saved $1.5 million in annual incarceration costs, based on fewer revocations of supervised release. Nationally, the revocation rate for offenders not in that type of program is 47 percent; the revocation rate of STAR participants is about 20 percent, officials said. While Philadelphia’s effort deals with high-risk offenders, the initiative in St. Louis is aimed at helping low-level drug offenders remain drug-free and the effort in Peoria, Ill., substitutes drug treatment for jail time for low-level drug offenders. In all, 73 of 79 participants in the Peoria program have successfully completed it. The program operated by the U.S. Attorney’s office, a federal court, the probation office and defense lawyers is designed for defendants whose criminal conduct was motivated by substance abuse. The Justice Department says over $6 million has been saved through the program — money that otherwise would have been spent on putting the defendants behind bars. On Tuesday in Philadelphia, the judge used a friendly, informal tone as he spoke to each man, congratulating them on new jobs, offering encouragement on setbacks, and gently penalizing one for missing an appointment with his probation officer. For their part, the men shared problems involving driver’s licenses and housing, but one also showed off a new community college ID card and another brought photos of his art projects — which Holder admired. Many then talked with support staff outside the courtroom to address their issues. Holder later met privately with Warner and several other graduates of the program, including a chef about to work in Paris and a soon-to-be college graduate. Warner said afterward that he began hiring former inmates to help out the judge and probation officers who worked with his class. He said he still talks frequently with people he met in the program, and tries to be a role model for them.